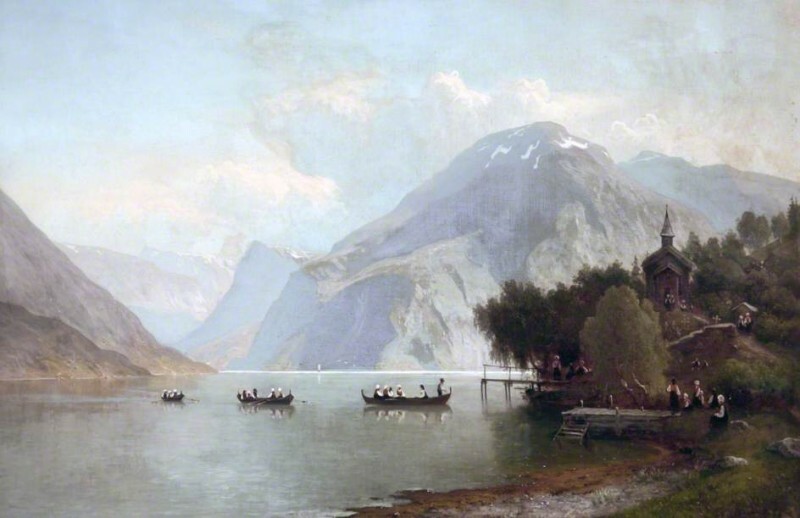 Tim Williams thought an Alpine Landscape listed as by British School to depict a Fjord in Norway – on the right is a church very similar in style to the Urnes Stave Church on the Lustrafjorden. Tim thought the painting may be by Georg Anton Rasmussen (1842–1914) or an artist working in a similar style: there was a Norwegian art exhibition organised by the Norwegian Minister and the curator of Brighton Museum and Art Gallery at Brighton, spring 1913. The group leaders recommended an attribution to Johannes Bertholomus Duntze (1823–1895). National Museums Liverpool put this information on file to review when there is time available. Could this work be by Georg Anton Rasmussen?